For years now, studies have identified a potential voting base for parties of the far right ranging from 15 to 20 per cent of the electorate. 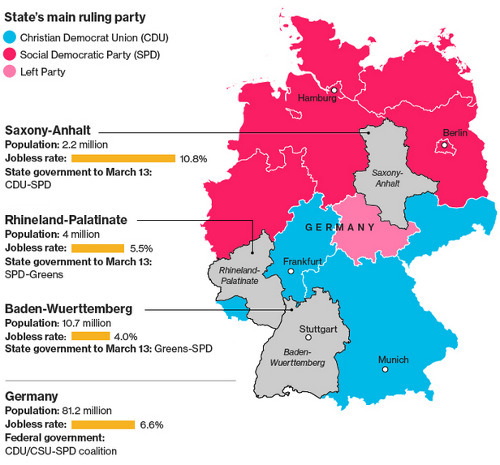 Germany’s rising right-populist force, the Alternative for Germany (AfD), has now managed to capture and concentrate this potential. But knowing this is not cause to breathe a sigh of relief – if anything, it’s quite the opposite, because the AfD is really just the tip of the iceberg. Germany is currently experiencing a dangerous rise in right-wing violence against refugees, which in turn is part of a broader right-wing Kulturkampf characterized by the anti-Muslim racism of figures like Thilo Sarrazin and growing reactionary mobilizations against the achievements of the women’s movement. 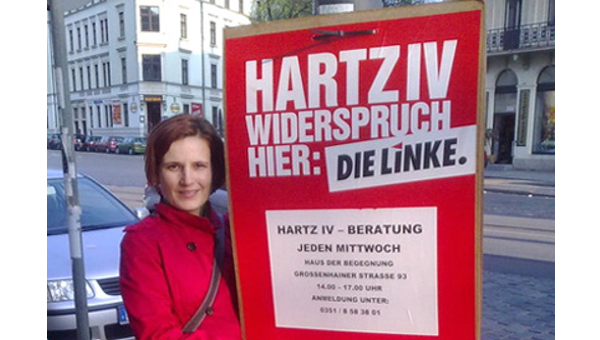 For all social and democratic forces, the warning sign from Sunday’s election that we should be most concerned about is that the AfD was the top vote-getter among the unemployed and working classes in Saxony-Anhalt and Baden-Württemberg, while many trade union–oriented wage earners voted for them as well. 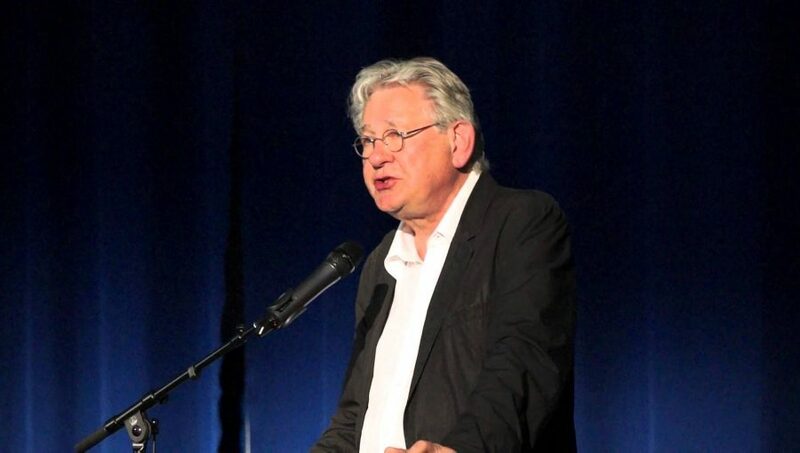 Both we, as well as the trade unions themselves, should be deeply alarmed that 15 per cent of union members in Baden-Württemberg and 24 per cent in Saxony-Anhalt voted for the AfD, despite the explicitly anti-union nature of the party’s program. The rise of right-populist parties in Europe can only be understood against the backdrop of precarization, unbridled competition, and social insecurity that so many people experience in their everyday lives. The Union parties (CDU/CSU), the Social Democratic Party (SPD), and the Greens shoulder most of the blame for these developments. The gap between rich and poor continues to grow, not least because the Christian Democrats, SPD, and Greens still implement policies for the 1 per cent. Meanwhile, millions of people in Germany are threatened with poverty in old age by so-called pension reforms. 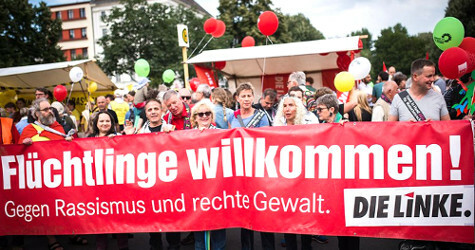 As the left opposition we will continue to push for our “social guarantees”: a sanctions-free basic social security instead of Hartz IV; a decent minimum pension; higher wages and good, secure, dignified work instead of constant stress and existential fear; gender justice; and the strengthening of social infrastructure with affordable housing, better healthcare, and education. But the neoliberal unfettering of competition has led to a situation in which solidarity is alien to the everyday experiences of many people, who instead discriminate “downwards” rather than defend themselves against antisocial politics and enrichment by the bosses and the ultra-rich. 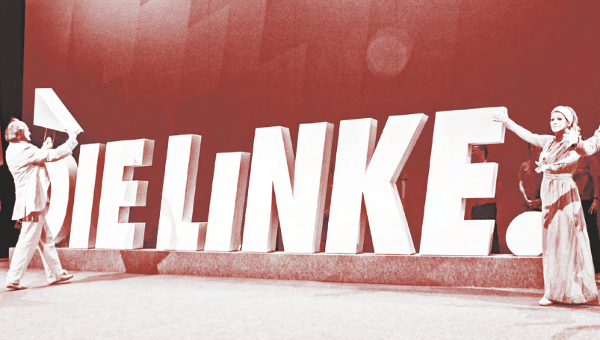 As Die Linke, our primary responsibility is to formulate a message of “solidarity in one’s own interest” and make our opposition to neoliberalism and the 1 per cent clear and understandable in the way we speak. Katja Kipping and I have oriented toward this sort of coalition since we were elected party co-chairs. But developing a contemporary emancipatory – antiracist and feminist – class politics that promotes self-empowerment and solidarity, that brings together the unemployed, workers, single parents, the precariously employed, and the downwardly mobile middle classes for solidary organization and left-wing protest is a huge challenge. The party has developed struggles against precarious working and living conditions; for the expansion of public housing, education, healthcare, and nursing for all; and for a radical redistribution of wealth as a strategic anchor that can also help to prevent the downwardly mobile middle classes from discriminating downwards. We have also begun to concertedly approach the growing numbers of workers, disproportionately women, in the social services sector. These workers are impacted by the neoliberal drive toward higher profits and competition the most, while at the same time their labour is undervalued by society as a whole. Together, our party should make greater efforts to get involved in the lives of these social groups while continuing to develop our own reform alternatives. In doing so, we will have to take the question of wealth distribution more seriously and, ultimately, declare war on the ultra-rich 1 per cent and Angela Merkel, who loses a lot more sleep over the concerns of the wealthy than she ever has over the refugee crisis. This does not mean we have to discard everything we have done up to now. Rather, we should build on existing practices as well as learn from the positive experiences of others – both our own party, as well as allied left parties and organizations in other countries. This article frist published on the Jacobin website.